You are at an event that you have been planning on attending for months. You spent weeks preparing an outfit and your friends have heard nothing but you talking about this special event. The day of the event comes and you spend all morning on Twitter or Instagram Live sharing your anticipation with all of your followers. By the time you get to the event, your phone is on 12% and surely will not even last through the start of the event. There are some open outlets but you didn’t even bring a charger. The event finally starts but all that you can think about is how your phone is dead and you will not be able to share your excitement with your followers. The nerves and anxiety build up and you can no longer focus on the event, as the consistent paranoia of disconnect from the digital world has taken over. According to a new study made by LG, almost 9 out of 10 people said they “felt panic” when their cell phone battery dropped to 20 percent or lower. Battery anxiety is at an all time high and gets even worse at events where the importance of having a functioning phone is increased. As you begin to plan your next event, do not let battery anxiety impact the experience of your attendees. Rent phone charging lockers to ensure that your customers are happy and engaged, not in constant search for the nearest outlet. 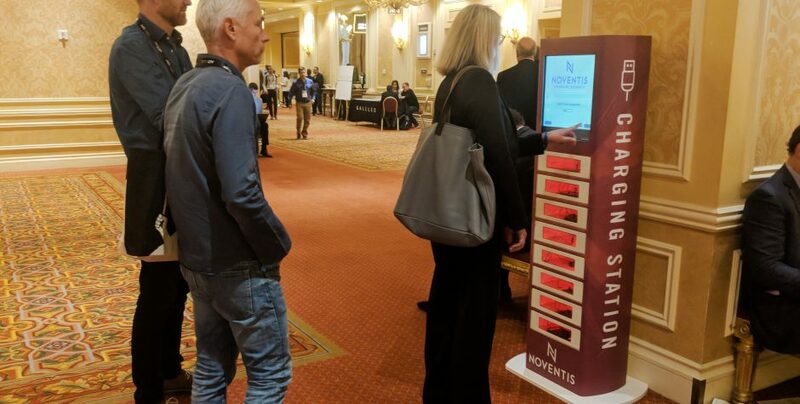 Phone charging lockers are perfect for any event and provide a safe and secure way for attendees to power up without having to wait at an outlet. Not only will renting phone charging lockers increase customer satisfaction, but it provides a source for custom branding your event or sponsors through videos, images, and unique wraps. Each phone charging station comes with 8 individual lockers. The LCD touch screen will prompt customers to select an open locker and enter a pin that they can use to later retrieve their device. The lockers are securely locked and glow red to indicate the occupied space. When the attendee decides to retrieve their device, they must enter their pin number and the locker will easily and automatically open. No more sitting around an outlet, disconnected from both the digital and real world. Happy and satisfied customers make for successful events, so be sure to rent phone charging lockers for your next event. The nightmare of an uncharged phone never has to ruin an event again. Get started on this quick and easy fix to your attendees’ battery anxiety.